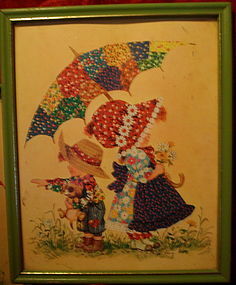 2-10 1/2 x 8 1/2 prints of calico patchwork children under umbrellas, signed Amy. Slightly shabby pale green frames with gold trim. 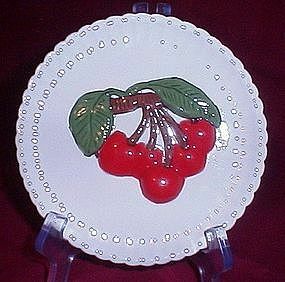 Style 7123D from Decorative Arts, Div of Condecor Inc, IL. Probably 1970's era. India Carved wood holder, has carving of a bird amid leaves. 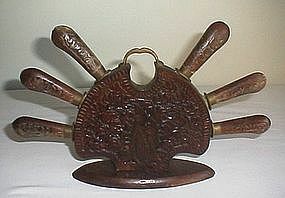 Holds 3 knives and 3 forks, handles are carved wood also with brass holding the cutlery in place. 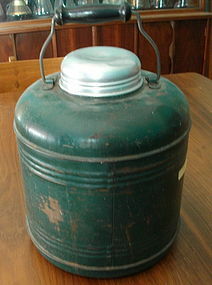 Brass handle on top. 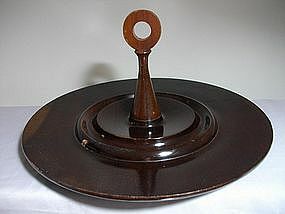 An unusual piece, it stands about 6 1/4" high and about 7" wide not including the cutlery.